Short clips about gravity, germs, the internet and other topics. Find out about dinosaur feathers, what they looked like, and how they changed over time. What are the top ten strongest animals? Watch dung beetles at work on Africa's Serengeti plains and see how they defend their precious dung balls. Watch a clip about the immense size of the Universe and what's in it. Find out about spacewalks, the effects of living in space on the human body and how long it takes to train as an astronaut. Watch a weekly video update on what's happening aboard the International Space Station. Answers to questions about weather, satellites and Earth science. Watch experiments with step-by-step instructions to try at home, including one where upside-down glasses of water don't spill. How much do you know about the Sun, the International Space Station and other space topics? Science is definitely not boring in this engaging exploration of what makes the world around us tick... An accessible and inspiring introduction to one of the most important subjects in the school curriculum. Although aimed at kids we think adults will love it too as it just might stir some long-buried science lessons! A fresh new approach to science, this book will inspire a new generation of scientists. 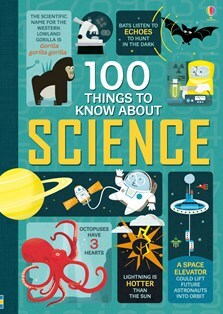 Packing in an absolute TON of different subject, 100 Things to Know about Science is a fabulous reference book split between various different sciences, with lots of brilliant exploration of the history of science as well as contemporary subjects too. Packed full of quirky illustrations and bizarre facts and figures, this is a wonderful book for knowledge-hungry youngsters of seven plus. Our 5-year old (and both his parents) find this book totally enchanting. Full of interesting things, wonderfully presented and explained. A real treat, and way, way better than other "facts about" books we've looked at. I am 8. I really like this book. It is fun and I learnt that crocodiles cry when they eat and scientists use narwhals to measure the sea temperature in the Arctic. I like the colours.